It’s Friday! I’m so ready for the weekend and for my husband to return home from traveling for work and relaxing with a glass of wine and popcorn. Yep it’s been one of those crazy busy non stop weeks, not much sleep, and needing some much needed destressing. Despite what my shirt says right now I am not “Highly Meditated”. This week I spent a little bit of the spare time I had looking at the best popcorn popper‘s but I just cannot decide on which one to buy yet, if you guys have any suggestions, please let me know! I am thinking this Simply Sweet Honey Popcorn might be on the menu tonight and relaxing outside by our outdoor fire table as it’s suppose to be 90F, yes for the first day of fall! Crazy and not normal for Minnesota. You may have seen a sneak of this Simply Sweet Honey Popcorn on Instagram Stories last Saturday. Or yesterday as I posted it on Instagram and Stories yesterday for an exciting sneak of the new Momentum bracelets we got with the new fall colors and sayings. I’m loving the “Live Simply” wrap, but really they’re all good and the girls were calling “dibs” on all of them. We made this popcorn last Saturday while waiting for our sourdough to cool for dinner and decided while making it to take a spur of the moment trip to the apple orchard. While we go every year we weren’t planning on going for a couple weeks but just decided to hope in the car and drive an hour to pick some Sweet Tangos for eating, some fresh picked cider, and hard cider. So we packed up some popcorn and headed to the orchard. On the way it decided to rain and drop in temp so when we got there it was pretty chilly and we weren’t prepared, well S and I weren’t, and were freezing. Didn’t stop us though and the apples are the sweetest and so good! While at the orchard we also saw our favorite local Bare Honey, the honey we used to make this popcorn. Their bees help with the apples in the spring so we thought that was pretty awesome. With the weather we’re having I wasn’t sure what I would post today, the Pumpkin Cheesecake Bars I showed on Instagram Stories this week, this popcorn, pumpkin oatmeal, or something with apples. Well I decided to hold off on the Pumpkin Cheesecake Bars until next week after another group of friends and family taste them. Apple recipes well the couple I wanted to get photographed didn’t because well this week got away from me, while seeming like it was never ending it flew by. I also decided to photograph this popcorn a couple times because I just didn’t think the photos were doing it justice, don’t ask me why. I felt this Simply Sweet Honey Popcorn was perfect for the first day of fall, and especially when it falls on a Friday! 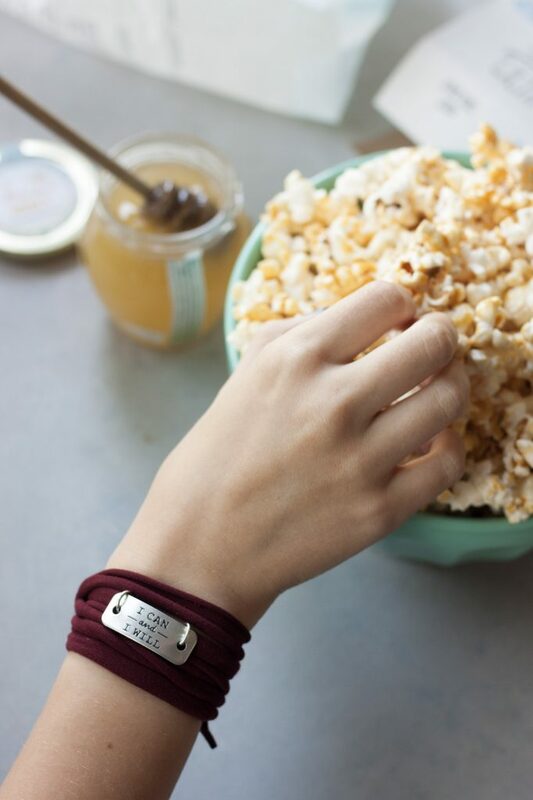 How simply sweet is this honey popcorn? Well it only takes 4 simple ingredients and can be ready in less than 10 minutes! You can make it with air or stove popped popcorn using popcorn kernels, which is what we did on Saturday. Or you can use microwave popcorn like we did this week. Either works fine, you just need to add a little sea salt if using air popped or unsalted popcorn. Then you just heat coconut oil and honey together over the stove for a couple minutes, stir in vanilla, and pour over the popcorn. Wait until it’s cool enough to touch and dig in! Now if you want a more “buttery caramel” we played around and used a tablespoon of Fourth and Heart Vanilla Bean Ghee and a tablespoon of coconut oil and it was good! S liked it better that way and it’s dairy and lactose free, which many don’t realize about ghee. We haven’t tried using just the Vanilla Bean Ghee but I’m sure it will happen as we like our popcorn and S has it a few times a week after school, usually not sweet popcorn though. We’ll keep you posted and I’ll update the post when it happens. How are you celebrating the first day of fall? 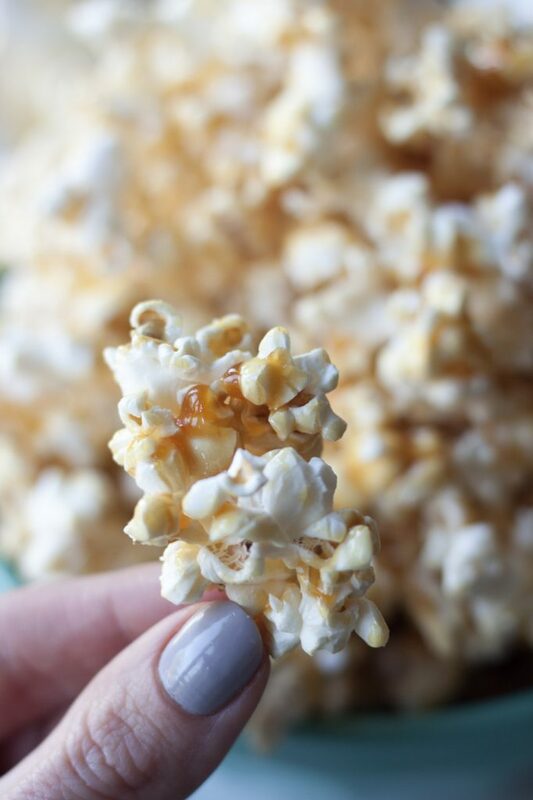 Simply Sweet Honey Popcorn is delicious honey kissed "caramel like" popcorn that is quick and easy to make and sure to sweeten snack time or your next movie night! Naturally gluten free and dairy free made with just 4 simple ingredients! In a small sauce pan over medium heat mix honey and coconut oil together using a rubber spatula. Pop popcorn and put into a large glass bowl. Bring honey mixture to medium high heat and once it starts to bubble and boil simmer for 1-2 minutes while mixing occasionally. It will bubble and the bubbles will turn from white to a darker amber color and get thicker. You don't want to cool it too long or it will get hard but you don't want it runny so it shouldn't take longer than 2 minutes of bubbling. Remove from heat and stir in vanilla. Slowly pour the honey mixture over the popcorn while mixing gentle to coat. Let cool 2-3 minutes, cool enough to touch, before digging in! This popcorn is best enjoyed right away as it is like other popcorn that is left out and will get chewy and stale (not a fan of stale popcorn). For a sweeter "caramel corn like" popcorn use 2 bags of popcorn, if wanting a little less sweet use 3 bags of popcorn. 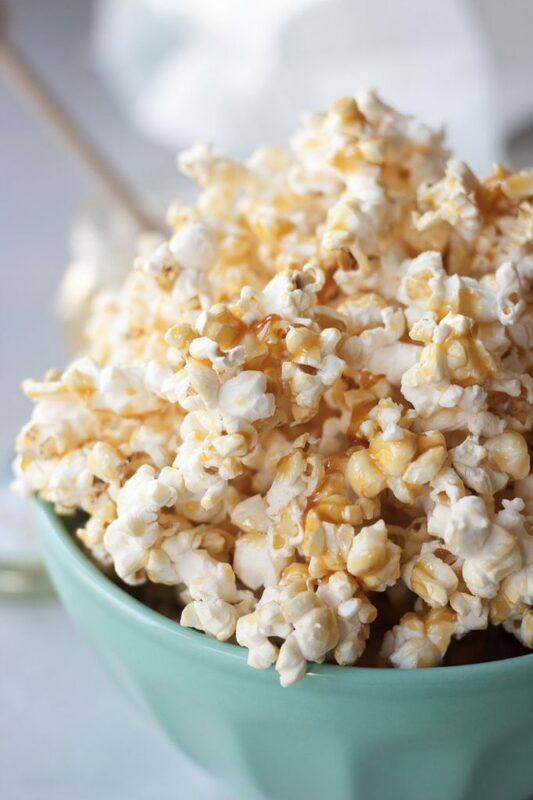 To make with popcorn kernels we use 1/2 cup of Quinn Popping Kernels and pop using coconut oil. If you want a buttery caramel we like to use 1 tablespoon of coconut oil and 1 tablespoon of Fourth and Heart Vanilla Bean Ghee. If using plain air popped popcorn add a dash of sea salt to taste. That’s a keeper! I need to get more of that Quinn popcorn! This sounds delicious! My girls would definitely gobble this up! 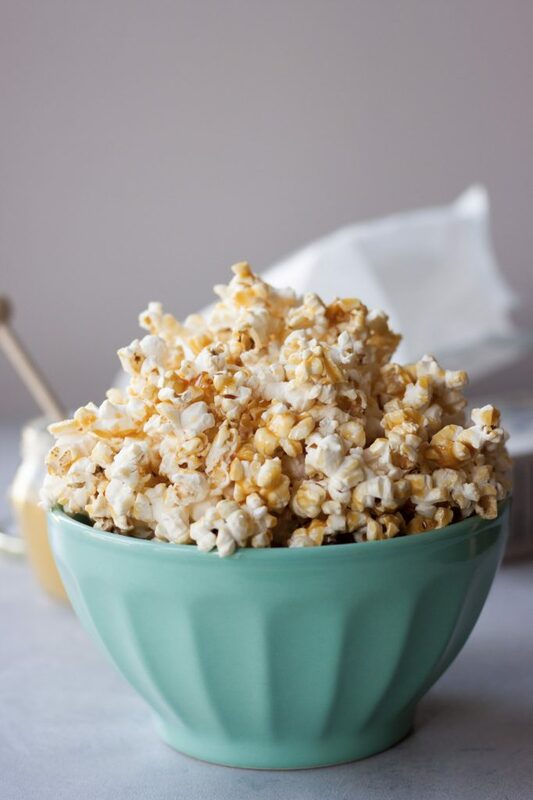 Oh my goodness, this is right up my alley – I’m a huge popcorn fan! This has been pinned! This popcorn sounds so amazing! Looks so addicting! I am SO BAD at making my own popcorn! It always burns or doesn’t pop. Wow this popcorn looks delicious! My family would definitely love this for a treat soon! Yum! We love popcorn for our family movie night, so I will definitely give this a try!! I’m sure my kids will LOVE it!!! I am such a plain jane when it comes to my popcorn. I really need to get creative like this. I love popcorn but never would have thought to add honey. Yummy salty sweet combo. This looks all sorts of awesome! 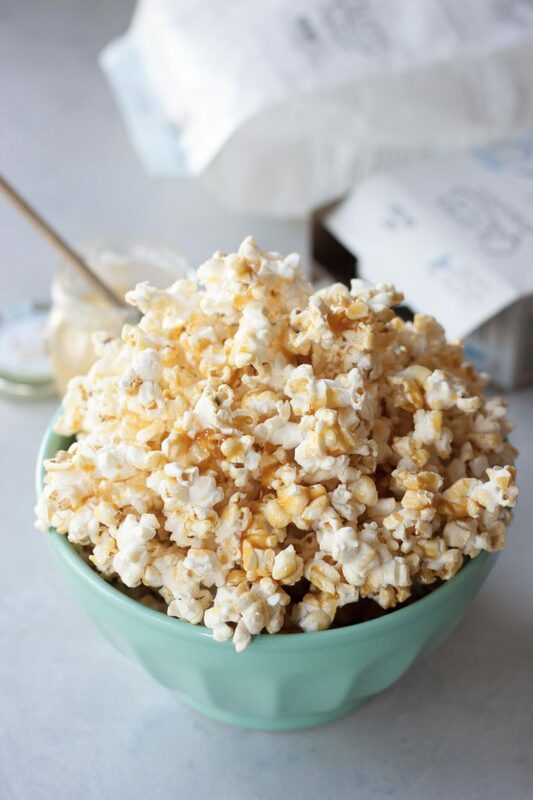 I love popcorn as a snack and the sweet + salty combo is one of my favorites!